Dennis Simon | Zimmerman Editions, Ltd.
Dennis Simon received his BFA from the Maryland Institute, College of Art (MICA) in 1969. 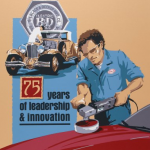 In 1986 and 1987, Simon designed the exhibit system for the Collier Automotive Museum in Naples, Florida, providing an ideal opportunity for him to combine his skills in exhibit design with his longstanding interest in vintage automobiles. Simon’s automotive illustrations have been featured in Road & Track, Sports Car International, Automobile, Thoroughbred and Classic Cars, Classic and Sportscar, and Vintage Motorsport magazines. 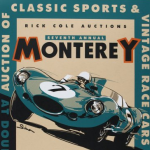 Favorite projects document automotive racing history, and he has designed over 60 original automotive racing posters for such clients as UNOCAL, Michelin, BF Goodrich, SVRA’s Bahama Vintage Grand Prix, and a series of Monterey Auction posters. Simon designed and illustrated the cover of the Indianapolis 500 program and poster in 1998. He was commissioned by the US Postal Service to design the 1992 America’s Cup Sailboat Race stamp. Simon’s recent works include a series of articles that he both wrote and illustrated for Christophorus, Porsche’s corporate magazine. His writing and illustrations were also featured in Auto Aficionado magazine. Simon has created poster editions for Porsche NA’s launches of their new Cayman and Cayenne, for their Rennsport Reunion vintage races, as well as a commemorative poster heralding the speed records set by their mid-engine Carrera GT. 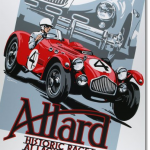 Commissions from Michelin NA include posters for Formula 1, the 24 Hours of Le Mans, the Tour de Corse Rally of Corsica, the Barber Pro Series, and the American Super Touring Series. He also publishes his Classic Victory series of posters under this trademark. New poster editions are always in the works. Privately commissioned paintings hang in both Europe and the U.S. and requests for posters and ties arrive from around the world. 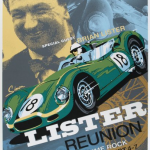 Simon’s designs have been praised in the automotive press as”Reminiscent of the great poster designs of the 20’s and 30’s” . . . “They present clean, powerful images that define the spirit of a ‘vintage’ event.” In all his imagery and design, his goal has been to bring back the missing elements of style, romance and panache that so characterized an earlier part of this automotive age.